Hello to all of the 36th AVENUE’s friends! and I’m SO happy to be here with all of you! Lately, we’ve had some crazy cold weather around our neck of the woods- which put me in the mood to share something warm and cozy this month! 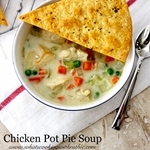 Chicken Pot Pie Soup! YUM!! Unroll pie crust onto a baking sheet and sprinkle with pepper and a pinch of poultry seasoning; cut into 6 triangles. Bake until puffed and golden about 10 minutes. In a large stock pot melt butter, add chicken, cook stirring occasionally for 3-4 minutes. Remove chicken to small bowl and set aside. Add celery, onion, flour, ½ tsp salt and ½ tsp poultry seasoning to stock pot. Cook stirring 1 minute. Stir in 2 C water, broth, half and half, potatoes; cover and bring to simmer. Simmer partially covered for 10 minutes. Add chicken and frozen peas and carrots. Return to boil for 3-4 minutes or until vegetables are tender. Divide among 6 bowls and top with pie crust triangle. Serve! plus it’s quick and easy to thrrow together for a week night supper! stop by and visit with me at What’s Cooking with Ruthie.com anytime! Oh this sounds great for one of these cold winter evenings. 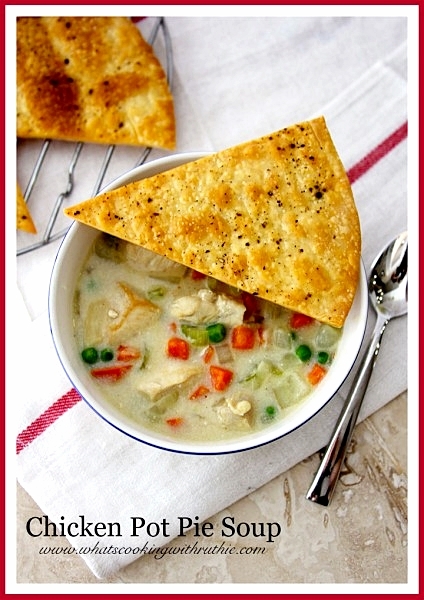 While we are thinking about warm and cozy soup recipes– here are a couple more for you to enjoy! Ruthie’s blog has a ton of wonderful recipes that you are going to love. alfo follow her on Facebook, Pinterest and Twitter. Thank you Ruthie you are awesome! basil. Smoked them for a few hours on the grill with pecan wood. THEN, made the soup…Thank you for a great recipe. mouth is watering big time! oh how i want this in my belly! Oh, I LOVE chicken pot pie. I use to eat those Frozen one’s from Marie Calendars (when I was young, of course : ) This looks delicious, Ruthie. Thank you for sharing it! I’ll be pinning it to my, “Soups On” board. Oh my! I have been on such a soup kick lately. This is awesome!